1894 During his time at the station my grandfather Gerorge Letts (2.3) dressed in white and wore a toupee, as did the rest of the staff. He also may have made use of the camels which the company owned or hired although it is not known whether these were for the use of the employees or for delivering cables. 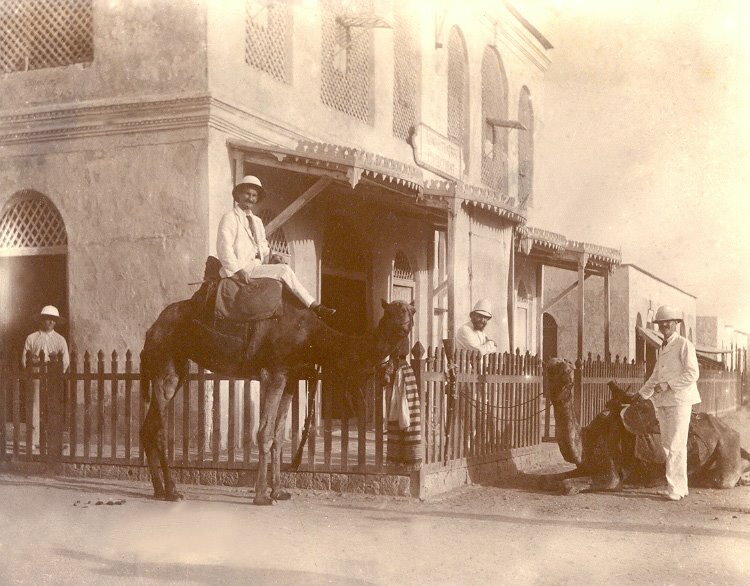 At the time Tangier was as heavily populated with Jewish bankers as it would be for many years to come. 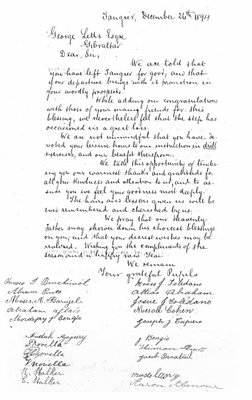 These gentlemen by the very nature of their work constantly used the telegraph and presumably got to know George (2.3) quite well. As the son of a military man he must have gone to a military school for a while and was probably quite good at Gymnastics. 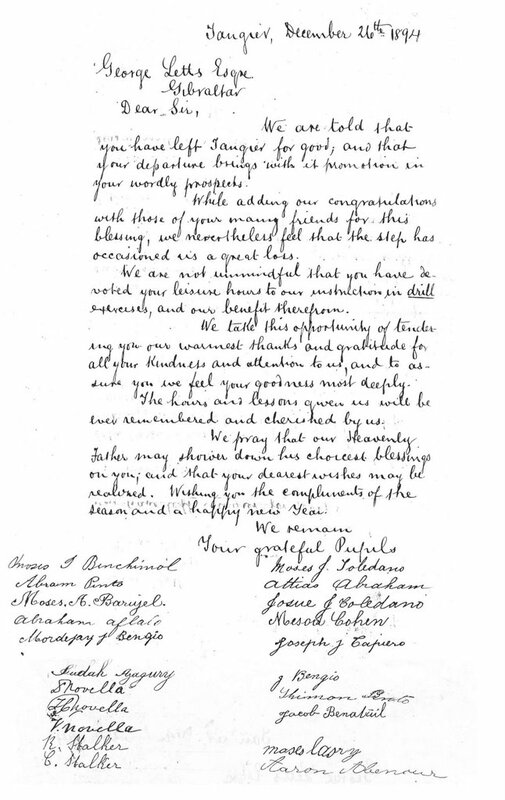 Thank you letter to George Letts (2.3). 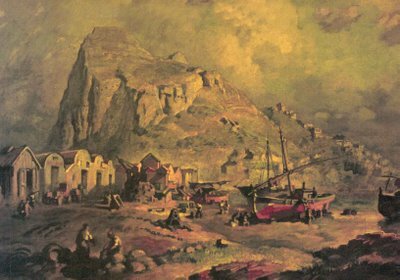 A rather Victorian view of the Rock .The picture is by Gustavo Bacarisas one of the better known Gibraltar artists. 1895 That year Vicente Blasco Ibañez serialised his book Flor de Mayo in El Pueblo. The name derives from a brand of picadura or tobacco manufactured in Gibraltar and tobacco smuggling features in the novel. Ibañez also wrote a short story based on Gibraltar about a beautiful Jewess called Luna Benamor whose name was the title of the story. Perhaps it was while he was writing this book that Ibañez sat at a waterfront café in Algeciras looking at Gibraltar. 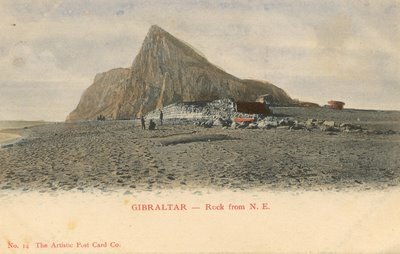 As he watched the heavy levanter clouds gathering over the Rock he is quoted as having made the following comment: 'El regalo que le manda Londres a su colonia'. One of the many 'classic' views of the Rock. 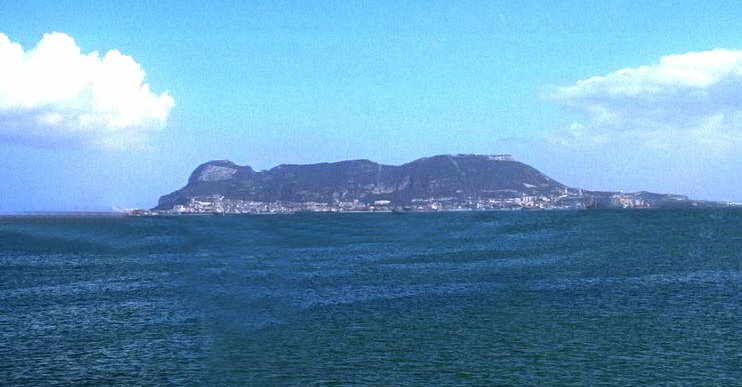 This is the shape that Blasco Ibañez saw although there were no levanter clouds when this photograph was taken. Regiments with fifes-and-drums were very common at that time. 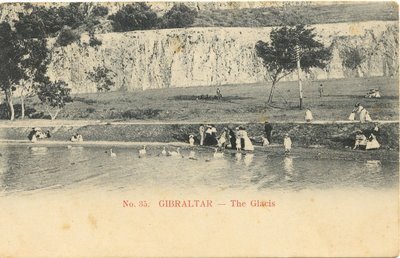 Despite the military aspect of closing the place up for the night, there was little control over the entry and exit of visitors to Gibraltar during daylight hours. Also that year my other grandfather Angel Chipulina (2.1), 'discovered' the most famous of all Gibraltar stamp errors. A ten centimos denomination stamp was printed with a blank value tablet, the so-called 'No Value' stamp. It is reasonable to assume that the discovery was not due to mere chance. Angel, contrary to Post Office regulations, was a keen philatelist with a considerable collection. His job as a clerk enabled him to buy up any new rare stamps and misprints before they went on sale. In fact he often bought complete sheets of these whenever he thought it appropriate. Angel’s (2.1) brothers incidentally were as keen on stamp collectors as he was and also cashed in on their position. The British Government now took the decision to spend millions on the modernization of the docks. Extensive naval works were started including the construction of graving yards, workshops and slipways. It was a period when the whole area surrounding Gibraltar was slowly beginning to recover its economic strengths. Many more people were now entering the Rock from Spain on permits and there was a great increase in activity in La Linea and Algeciras. 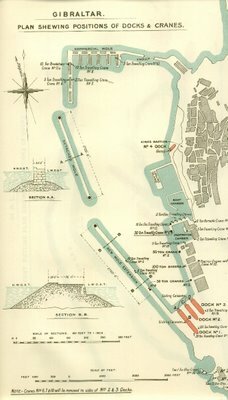 The modernization of the Naval Dockyards. 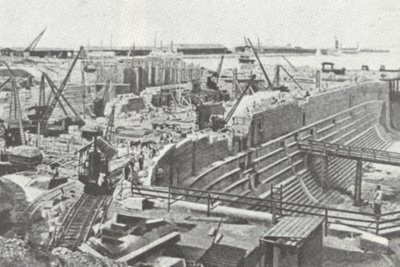 This photograph was taken in 1904 during the construction of the huge dry docks. The yards would end up being one of the largest in the world. More or less contemporary postcards. On these you were allowed to write on the blank space below the photograph. The back was reserved for the address. It was around this period that Diego José's (3.7) wife Magdalena Mancilla (3.8) found out that she was suffering from cancer. To relieve the pain, the doctor prescribed morphine. Her daughters were willing to give her the drug on demand but not Maria Luisa (2.4) who insisted on sticking to the prescribed dosage and intervals. For her pains she was accused of being heartless. It seems that she not only had more strength of character than her sisters but also more common sense. My grandmother Maria Luisa Gomez (2.4). She is wearing a horseshoe broach which she must have been very fond of as it appears in quite a few photographs of her. The photograph was taken by Cavilla and Bruzon in Gibraltar. On the 15th of June Angel Chipulina (2.1) married Memo Sacarello (2.2). They were both unusually old for marriage given the norms of the era. He was 28 years old and she was 36. The day they married Memo (2.2) was three months pregnant thereby carrying on the tradition begun by Angel's (2.1) grandfather albeit in a rather more discreet manner. By now Angel (2.1) had become a man of certain distinction and was reputed to have had exquisite manners. A slim and elegant individual with receding hair and a close trimmed moustache, he had a quaint habit of always washing his hands twice. The only photograph that I have depicts him as an archetypal smartly dressed, waist-coated bureaucrat, which is probably what he was. 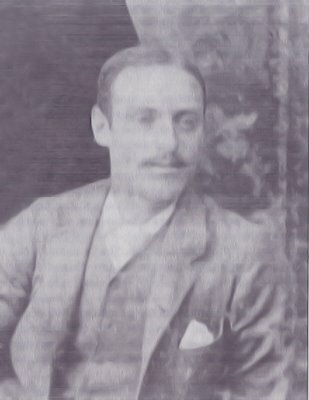 By now he had become an important member of what was then a rather exclusive and conservative Casino Calpe and was instrumental in getting a friend accepted, a gentleman by the name of Benady, who became the first ever Jewish member of the club. It was a refreshingly liberal attitude in what was an overwhelmingly hide-bound era. That stern managerial exterior cloaked a deeper man. His wife, Memo (2.2) was also a woman of great charm. Thelmo, however was a different kettle of fish. He was a large man with a gruff yet wheezy voice and in later life he developed watery eyes. He affected a close cropped military style moustache. He rarely moved without a hat and cane and was given to wearing bow-ties. Thelmo reputedly married into money, perhaps around this time. His wife, nee Baldasano, had a habit of bestowing multiple perfumed kisses to all and sundry. They had two daughters, Angelita and Pepi. 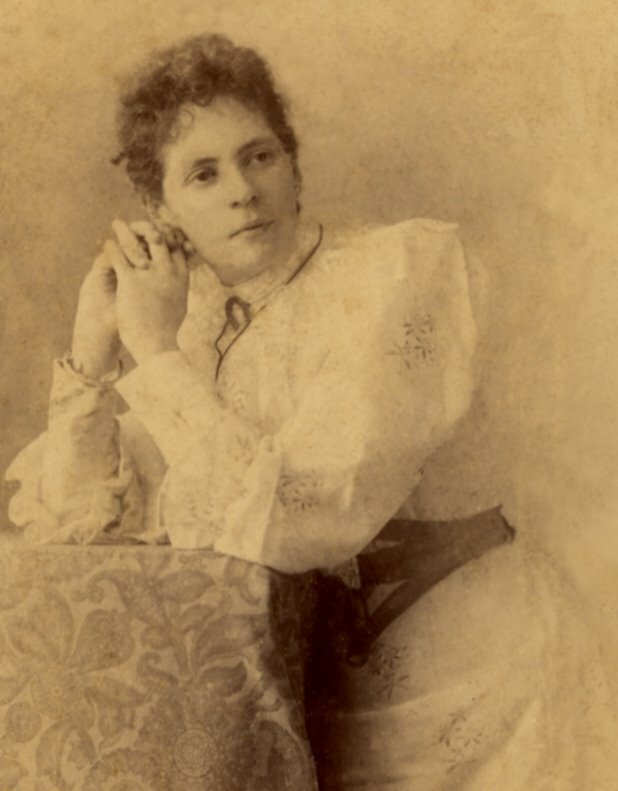 The former was a rather masculine lady, and the latter was decidedly eccentric. José-Angel was gay and never married. He and the bevy of sisters lived in a flat above the post office which was a government quarter. He was often a source of embarrassment to the family. At one time he took a fancy to a young postman called Bossio on whom he bestowed expensive gifts. He was never without his Panama hat and even wore it when he was indoors. Angel (2.1), of course, had other interests in life and on the 20th of December his wife gave birth to my father, Joseph Chipulina (1.1) in 256 Main Street. He was to be known to his family and friends as Pepe. My grandfather George Letts (2.3) .His grandson Eric Chipulina would grow up to look exactly like him.